One of the first blossoms in Spring in New Jersey are the yellow forsythia bush blossoms. In California and other warm-winter areas, forsythia may bloom in January, while here in New Jersey and in Iowa it typically blooms in mid-April. The three-year-old I care for full-time loves all flowers and squeals with joy when she sees the yellow forsythia. Clusters of one-inch-long, bell-shaped flowers range from pale to blazing yellow, only last for two to three weeks. So we made this craft so she can enjoy forsythia all year long on her bulletin board. Draw or paint slim brown branches with a marker on white paper for young children. Older kids should draw or paint their branches themselves. Then let the kids draw or paint a few green leaves on the branches as well. Caregivers can draw or paint the leaves for younger kids. Allow kids tear pieces of yellow tissue paper and and crumble them into blossoms. 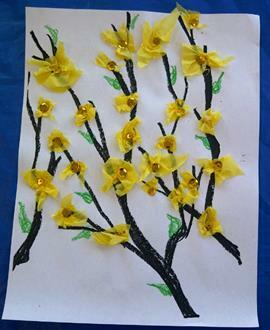 Let the kids glue the blossoms on the branches for spring forsythia blossoms. For children that don’t put tiny pieces in their mouths you can let them add gold sequins to the center of the tissue blossoms.